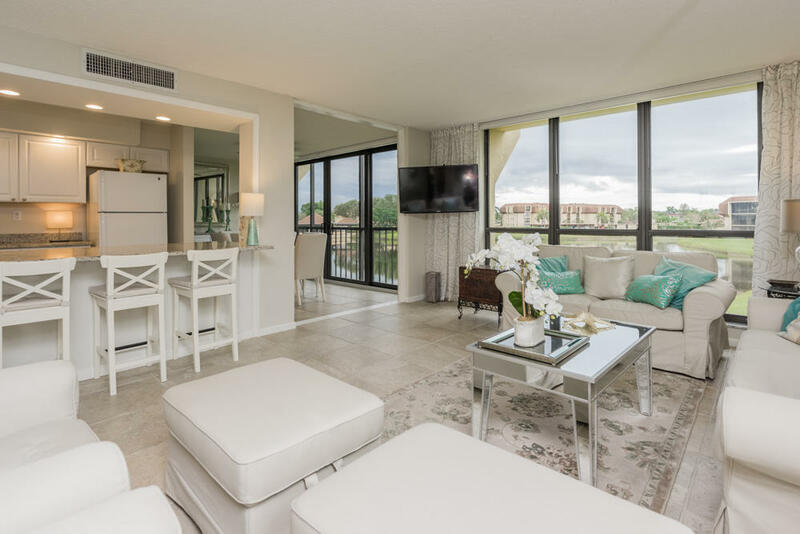 Magnificent lake views from this spectacular top-to-bottom renovated, bright & spacious, 2BR/2BA open-plan condo located in the sought-after Palm Beach Gardens community of Woodland Lakes. Desirable features include floor-to-ceiling and wall-to-wall windows & sliding glass doors, split-plan bedrooms, neutral colors, high-end large tile flooring, an open-concept gourmet kitchen with white cabinets, granite countertops, and a breakfast bar, and a large master suite with lake views and 2 walk-in closets. The private balcony has been fully enclosed and is being used as a dining room. This home has plenty of extra storage and also includes an in-unit washer & dryer inside of a large utility closet. Located near elevator. HOA covers insurance.